Chilmark will mark Crab Corner with formalized signs that indicate a shock hazard may be present in the water, selectman Jim Malkin, the board’s harbor liaison, announced at the selectmen’s July 11 meeting. Crab Corner will also be cordoned with fencing, per a consensus reached at that meeting between the beach committee, selectmen, and executive secretary Tim Carroll. Crab Corner is a popular children’s swimming and wading spot, bookended by the Menemsha jetty and the town’s transient dock, where several people have reported feeling electric current when in contact with the water, including a group of schoolchildren on a field trip. The signs are a national code necessity, Mr. Malkin said, and also part of an “abundance of caution” approach by the town. Beach superintendent Martina Mastromonaco described the current hand-lettered “No Swimming” sign positioned between string-draped traffic cones as “jury-rigged,” and said she was in favor of more professional signage, but cautioned against placing placards that could be misconstrued. “I mean, honestly, there’s sharks in the water, too, so if you put a sign up that says warning, potentially it could mean shark,” she said. Sharks notwithstanding, she touched on other threats she perceives at Crab Corner. “There’s a lot of potential hazards in that area,” she said. “I’ve seen kids before we had the shocking thing jumping off the dock, and you know it is a boating area.” She also said recent dredging has left the area with a steep drop-off. 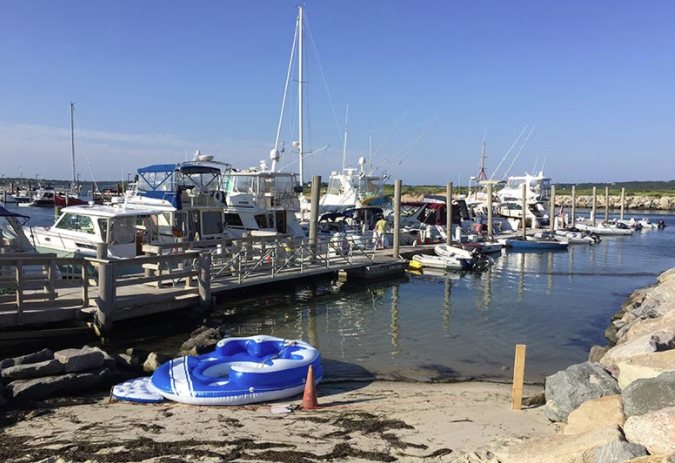 Ms. Mastromonaco also expressed concern about her lifeguards’ ability to cover Menemsha Beach and Crab Corner simultaneously. Mr. Malkin said he was open to discussing placement of a dedicated lifeguard at Crab Corner. “Until our town electrical inspector signs off on what has been done — signs off on what we’re doing and then on what was done — I’m not willing as the liaison to the harbor to put people in potential jeopardy,” he said.